It's our state motto: Ad Astra per Aspera, meaning through hardships to the stars. That is what the Pittsburg High School Debate & Forensics program has done as it is recognized as a Top 100 program from all programs across the United States by the National Speech & Debate Association earlier this school year. 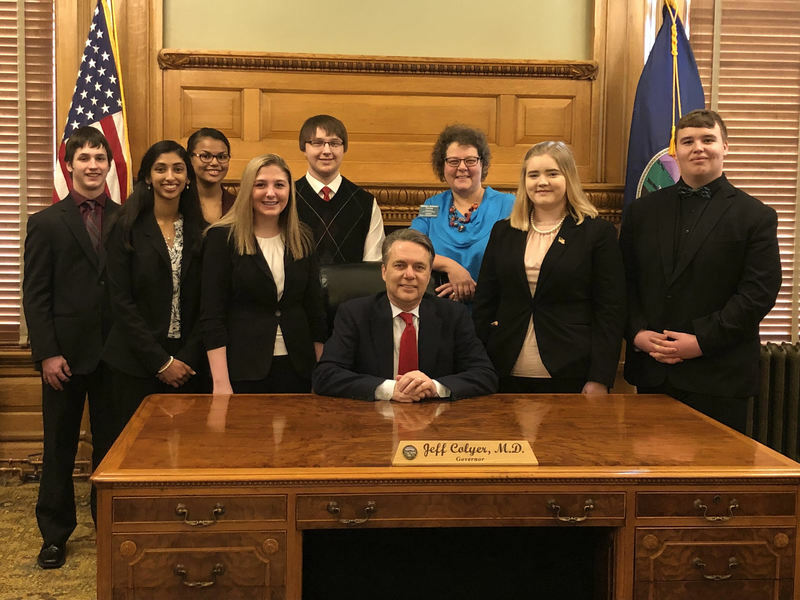 On Thursday, Kansas Representative Monica Murnan introduced and recognized seven students and Julie Laflen, PHS Debate & Forensics advisor, in front of the session of the Kansas Legislature for the program's national placement. "I’m just so proud of the students and what Julie has done with that program," Rep. Monica Murnan said. "She has grown the program and made it a great experience for a diverse group of kids. This is what public school is about; it’s curriculum as well as extracurricular activities." The program has grown from 12 when Laflen first started teaching at the high school and after two years, it jumped to 30. "In the last four years, it has grown to about 75 students between both debate & forensics," Laflen said. "To be in the top 100 out of more than three-thousand programs is such an honor," she said. "I think it speaks volumes for how hard the students are working and the dedication they have for the program." Gina Mathew, a PHS senior in her fourth year of debate and forensics, says she never expected to be recognized in the statehouse. "I didn't know students got these sorts of opportunities to be met face-to-face with actual legislators especially just doing an activity that we consider within our own community as a high school event." Last semester, Laflen received a letter from J. Scott Wunn, the executive director of the National Speech & Debate Association, recognizing the program as being ranked 96th of more than 3,000 programs nationwide. Layton Marler, a PHS junior, has been in the program for three years. He says the honor is surreal and he never imagined students from Pittsburg would get national recognition for debate and forensics. "All of our hard work has paid off," Marler said. "It's a huge honor to be in the top 100 when there are other students across the nation who also commit long hours in preparation and memorization of speeches every night. It's ridiculous." In addition to the presentation in front of the Kansas House, students worked as pages for Rep. Murnan. “So many times, when people think about Topeka and the work the legislature does they think it’s all about the politics," she said. "These students will be able to see how policy is connected and the daily work we do to form good policy for the state." Marler has plans to major in political science and sees this as a great way to see the inner-workings of state government. "I just want to see what it looks like; how it functions and get to meet the people who influence what happens in Kansas," Marler said. Rep. Murnan and her husband Rob have three daughters who were in debate and forensics at Pittsburg High School. "Debate and forensics were just one of the best things for our girls to be a part of at Pittsburg High School. It builds a unique set of skills. They all work in policy and it’s because of teachers like Bob Tindel and Julie Laflen who have gotten them to where they are today." Web-extra: Check out the photo gallery of the student's trip, which included sitting in on a committee meeting, and learning about the medical options situation from the Kansas Chief Medical Officer, Greg Lakin.